The company also plans to endow fridges with an ability to link up with smartphones. This features is extremely convenient, because you can, staying in a shop, send a request and receive all information about the products in the refrigerator. You won’t have to look into the unit in advance, study the expiry dates and the necessary amount of goods for buying. Also there is no need to make out a shopping list by hand. You just need to send a request and the fridge will answer you! Such ins and outs do simplify laborious household duties and so there is no need for housewives to weight themselves down and keep unnecessary information in their heads. At long last, let the unit think for you! 2.LG Electronics is also gravely concerned about the fact that our household appliances are not smart enough. 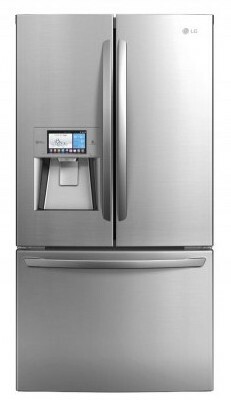 Innovations in refrigerators’ production have been introduced within the limits of LG Electronics Smart ThinQ Technology. 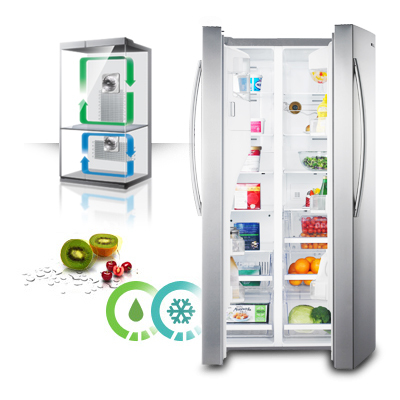 Smart Manager option provides you with access to the refrigerator from your smartphone or iPad. It allows you to control the availability of goods, their amount and pull-dates. Moreover you are even able to learn on what shelf exactly the certain product is placed! Probably, these features are extremely essential for those people, who aspire to hold the keys of everything. What if your husband has decided to shift the goods on shelves? Evidently Smart Manager technology doesn’t allow to watch over the goods in the fridge only, but also over the households’ goings-on as well. Well then, it is rather useful! Apart from Smart Manager technology you will also find a unique Health Manager that will make up a menu or find recipes specially for you. Manager takes into account your personal profile data, like age, weight, height, gender, etc. Very handy option for those people, who need to keep to a special diet, like diabetics, hypertensive patients, etc. It can even recommend you a daily or weekly meal plans, so don’t bother with hanging on culinary sites. 3.If you still have any doubts concerning the fact that refrigerators are not smart enough, we would like to offer you one more idea, developed by The University of Central Lancashire and Internet-supermarket Ocado. They have designed a refrigerator of the future that longs for independence at most. It is equipped with special sensors that are aimed to determine smells, thereby the unit can “smell” addling goods and notify a homeowner about that. Furthermore, owing to the fact that shelves consist of small plates this refrigerator can bring perishable goods to the fore. The unit scans products and can even place orders online in compliance with the preferences of the happy owners’. Unfortunately (or may be fortunately?) this invention hasn’t been released in mass production yet. Besides the developers plan to equip this device with self-cleaning technology. However, the manner in which this will be released, still remains a mystery (mini-robots?). 4.In the end we would like to offer one more novelty to you. If exchanging messages with fridge is not enough, then you would appreciate a more close and emotional communication with this miracle-device. The University of Tokyo and Sony Computer Science Laboratories have developed a Happiness Counter model that is equipped with smile detector. The inventors are sure that it is possible to become happier, if smile more often. The main idea is realized this way: if you open the fridge smiling, then you will see a happy smiley on the display and the door will open easily. If you don’t smile, a sad smiley will appear and you will have to apply some force in order to open the door. In this unsophisticated manner the developers take care of the customers’ mood, making them smile in fact. Otherwise you won’t get any food! Undoubtedly home appliances are designed to simplify household duties of housewives. And it is up to you to decide – to shift a part of household cares to a refrigerator or to keep a check on everything. Household appliances become smarter and smarter. The new generation of refrigerators is equipped with various features that are designed to denote us when to go shopping, what to buy and what to cook for dinner. So lets take a closer look at these smart assistants.